The top end of the Anticyclone is still with us and initially gave a light NW wind which came and went and then increased. 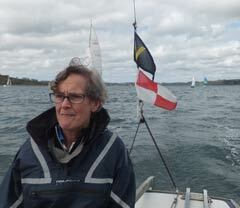 Race Officer David Day supported by Sally Anne set a NW group and course 2 which gave Vilt and Governor to Starboard, two rounds with the club turning mark to Starboard at the first round. Seven boats raced in the third of the Sailtech Spring pursuit series with Sweet Friday starting first, Aries then followed and was chased hard by Trifle and Popincoota, (nice to see Jane and Alan back on the water), Aurora started a few seconds late. Wilkie and Kaimana brought up the rear. The wind as two weeks ago was fickle and what was initially a beamy, broady reach with port pole kites gave rise to a close reach going very hard forward of the beam as we rounded Trefusis point. Aries and Aurora went up into disturbed and dead air while Trifle, Wilkie and Kiamana stayed lower. We could see Sweet Friday in the distance getting ever closer to the wind. Aurora held her kite, as did Aries but Trifle had to drop early as we were shy of the Vilt. Sweet Friday rounded followed by Aurora and Popincoota, then Aries. We did a tight rounding and stood up above Aries on the run to Governor. Helms were swopped and the skipper executed a windward launch kite! Aries tried to luff up Trifle but was blown away by some very dirty air of a much larger spinnaker. 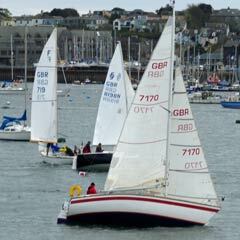 The two other GK24s, Wilkie and Kiamana started to play catchup on the beat back from Governor to the turning mark. Aurora slipped ahead of Sweet Friday and Popincoota to take the lead at the mark and then gybed onto starboard in front of Trifle who called starboard and windward boat to keep clear. A short luff by Trifle ensured a narrow clearance. The second round commenced. Again the wind came forward of the beam off Trefusis. Aurora held her small kite while Trifle made an early drop. Aries held on to her spinnaker all the way and went backwards! Aurora led on the gybe to Governor followed by Sweet Friday and Popincoota. Trifle executed another windward launch and held off Wilkie for the run. Governor was rounded and the beat to the finish line ensued. Most boats stood on from the docks toward Trefusis but Trifle tacked early under Sweet Friday and had an amazing lift most of the way up the harbour. Aurora finished first with Wilkie in second place and Popincoota third. This is Aurora's third consecutive win in the series. A good start to Mandy's season! Sweet Friday and Trifle traded tacks up the final beat and Sweet Friday pipped us to the finish by a toot. Aries was 6th and Kiamana brought up the rear. We went back to the club and had tea and cakes care of Sue Clark. 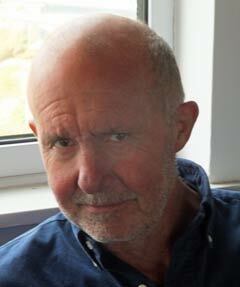 Thanks to Dave and Sally Anne, Jeanette in the ops room and Malcolm for the results.